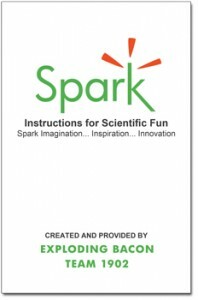 4-H Exploding Bacon Robotics Team developed Spark Science Kits 16 hands-on experiments based on our experience with after school and summer camp science programs. With grants and community support, we provide these kits free of charge when we have them available. Instruction Manuals now available in English, Spanish, Creole, Greek, French, and Hebrew!